A cross-cutting policy debate on Land degradation, climate change and migration. 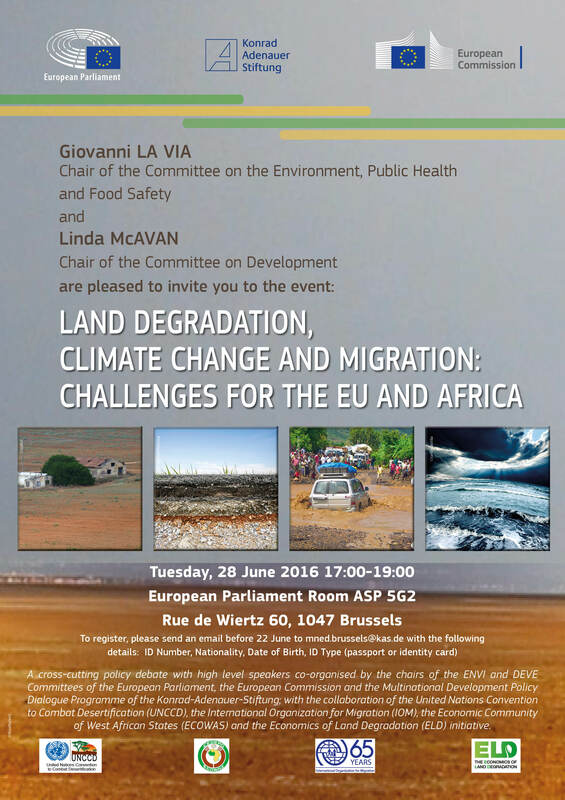 Challenges for the EU and Africa will take place on 28 June 2016 (17h00-19h00) in the European Parliament (Room ASP 5G2, Rue de Wiertz 60) in Brussels. 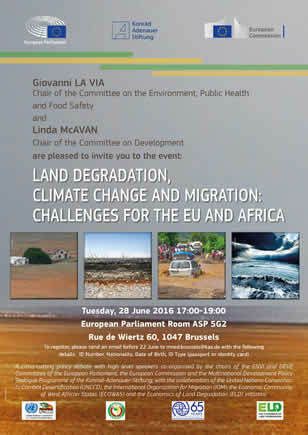 The high level expert discussion will be co-hosted by the Chair of the Committee on Environment, Health and Food Safety, Mr. Giovanni La Via MEP (EPP) and by the Chair of the Committee on Development, Ms Linda McAvan MEP (S&D). This event is jointly organized by the European Commission and the Multinational Development Policy Dialogue of the Konrad Adenauer Foundation. It will give occasion to exchange and discussion among governmental officials from EU institutions, representatives from the United Nations Convention to Combat Desertification (UNCCD), the Economic Community of West African States (ECOWAS) and the International Organization for Migration (IOM) as well as international stakeholders in the field of land degradation. Please find here the programme with further information. Land is a finite resource. It is subject to competing pressures from urbanisation, infrastructure, increased food, feed, fibre and fuel production and the provision of key ecosystem services. But it's also a shrinking resource. Almost 1000 km2 of agriculture or natural land disappears every year in the EU, as it is converted into artificial areas. More EU land is affected by degradation all the time, and ecosystem services are lost as a result. This is a global problem. The EU contributes to land degradation in third countries, as we are a net "importer" of land embedded into imported products. Demand for areas to settle, grow food and biomass is rising around the world, and climate change is likely to impact on land demand, availability and degradation. But the EU is taking action. The 2011 Road Map for Resource-Efficient Europe, part of Europe 2020 Strategy has the following aim: "By 2020, EU policies take into account their direct and indirect impact on land use in the EU and globally, and the rate of land take is on track with an aim to achieve no net land take by 2050". The 7th Environment Action Programme for the EU calls for targets to be set to limit land take. The Rio+20 conference recognised that land and soil degradation are a global problem, and proposed to strive for "a land degradation neutral world in the context of sustainable development". Raise awareness about the value of land as a resource for crucial ecosystem services (provisioning, regulating, cultural, etc. ), about how the gap between land demand and the availability of the resource can increase particularly in the context of global challenges, and about how to deal with synergies and trade-offs between land multiple functions. Provide pointers for further action at EU level. Through evaluating the effectiveness of current policy instruments at National, EU and global levels, it would define the sustainable level of ambition for a set of objectives and assess options for EU contribution to a more sustainable management of land as a resource. A conference on "Land as a resource" took place on 19 June 2014 in Brussels. The outcome will provide useful insight in view of the development of action at EU level on "Land as a resource". More information is available on the conference website. A recently published study assesses the feasibility of setting up a suitable framework for measuring progress towards a more sustainable use of land as a resource. The objectives and targets proposed by the Roadmap for a Resource Efficient Europe (related to land take, land recycling and land degradation) are used as a starting point. Possible indicators and targets to promote the multi-functionality of land and preserve its environmental functions, as well as to reduce the impacts of EU demand on global land degradation, are also analysed. Where appropriate indicators are available and the associated baseline is well defined, the relevance and feasibility of setting targets is assessed, covering technical, socio-economic and administrative aspects. This is informed, in particular, by the experience from the few MS having defined land and soil-related targets. The study proposes several possible future targets that could be set at the EU level, subject to a number of improvements with regard to indicators definitions, monitoring processes (methodologies, resources and timeliness), methodological approaches (e.g. with regard to relatively new indicators such as the Weighted Urban Proliferation or the Land Footprint), and the overall knowledge base. Alternative approaches to target setting (e.g. policy guidance) are also identified. A service contract has helped shaping the problem definition and detailing possible areas for EU action developing a common EU vision for land use efficiency and halting land degradation, taking into account the current policy framework and the principles of subsidiarity and proportionality.